Chaney is speaking his arms are extended, symbolizing Freedom of Speech. Schwerner is carrying the Torah, symbolizing Freedom of Religion. Goodman has his hands over his friends' shoulders, symbolizing Freedom of Assembly. There is also a locked ballot box, and in front there is a magnolia with an eternal flame. 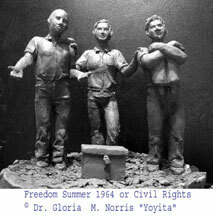 Law Freedom Rights, Copyright 1976-2013 Dr. Gloria M. Norris, Yoyita. All Images are protected by Copyright. 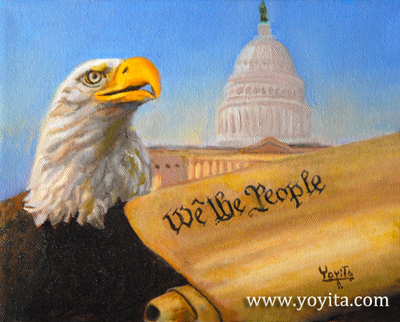 Use of these images is strictly prohibited from any form of reproduction, transmission, performance, display, rental, lending or storage in any retrieval system without the written consent of the copyright holder Click to contact the artist for prices or information.